Norbert Lazar, who goes by “Norb,” has faced several major watersheds in the life of his business. First he founded The Phantom Gardener in 1982 with a clever concept: building and maintaining organic vegetable and fruit gardens for Hudson Valley weekenders such that produce appeared on the clients’ tables every Friday. Lazar and eventual partner Gary Ocean moved like “phantom gardeners” through the properties on the weekdays. 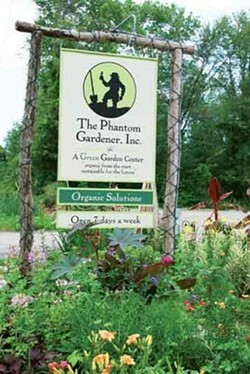 Some clients pressed Lazar and Ocean to do their ornamental gardens as well, so the next big event was founding their organic garden center, The Phantom Gardener, in 1992 in Rhinebeck. This allowed them to provide better-quality plants and materials for their landscaping clients. Lazar and Ocean would switch off handling the garden center and landscaping arms of the business. The garden center has always sold strictly organic products; you won’t find any synthetic fertilizers or pesticides there—highly unusual in the “green” industry. In 2001, Lazar came to a crossroads when Ocean decided to leave the business, and Lazar bought him out. His wife, Pamela Neimeth, became his partner. “Pam has helped immeasurably in the organization and efficiency of the business, and has helped clarify the direction we are headed in,” Lazar says. This forced another major change: “I realized I couldn’t do both the garden center and the landscaping, so I let the latter gradually go,” Lazar says. Doing so has allowed him to focus on the garden center business and his ongoing and burgeoning interest in sustainability education. Lazar and Phantom are approaching another major watershed: He’s envisioning moving from his home in Milan to the Phantom Gardener grounds and, partnering with sustainable energy companies, building a home and landscape that serve to teach as well as giving a tired Lazar a chance to focus his energies. “During the growing season, I’m home maybe one day a week,” he says. This is enough time to weed and mow (Lazar loves his rechargeable electric mower) but not to develop any kind of sustainable landscape, filled with natives and edibles as Lazar envisions. If he and Pam moved to the Rhinebeck site, they could simplify. He’s already made one major step in this direction by putting in an extensive, attractively designed and fenced vegetable garden on The Phantom Gardener grounds. At home Lazar has amassed a collection of interesting and beautiful specimen plants and functional groundcovers. He is passionate about native plants, but he is not a native plants purist. 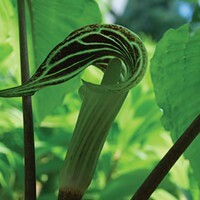 His plant choices at home are a mixture of natives and non-natives that require little care. “If they don’t make it, they leave the premises in one way or another,” he says. In this way, he can really speak to customers about what plants are truly sustainable given the myriad challenges they face in a given site. The challenges of Lazar’s home property include deer browse, deep shade by sugar maples, dry areas underneath the maples, and extremely wet areas in lowland parts of the property. He also has needed screening plants to provide privacy. Lazar practices the “right plant, right place” approach, key to success in any planting situation. In “right plant, right place,” one makes a careful study of the site conditions before choosing plant material. To provide screening between his property and the road, he put in five doublefile viburnum shrubs (Viburnum tomentosum var. plicatum) about 20 years ago, when they were one-foot-tall bare-root seedlings. 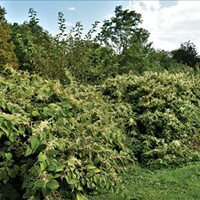 They’re now a 15-foot-tall informal hedge and provide three-season interest: lovely tiers of white flowers in spring, handsome red berries in summer, and burgundy fall foliage. Also, they are deer resistant and don’t attract the dreaded viburnum leaf beetle. Doublefile viburnum is native to Japan and China. What to do in the dry shade beneath the canopy of the sugar maples? 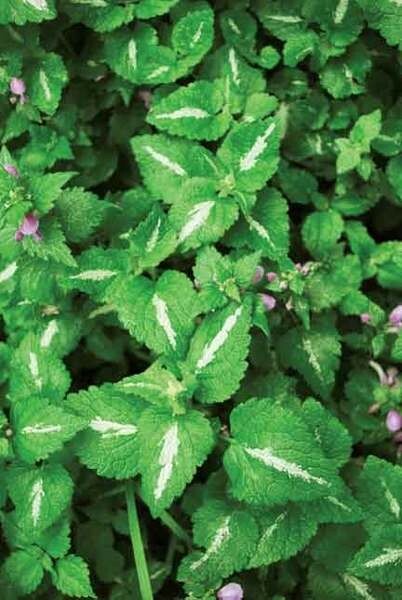 Groundcover purple dragon (Lamium maculatum) and false lamium (Lamiastrum galeobdolon Herman’s Pride) are members of the mint family that form gorgeous carpets under Lazar’s maples. In the wetter areas, he’s embraced chameleon plant (Houttynia cordifolia), which is undaunted by the constant wetness. These three groundcovers are plants that can spread mildly to moderately aggressively, but Lazar feels they serve important functions: They cover the ground, protecting the soil, and they eliminate the need to weed, mow, or mulch, all of which take energy (human or fossil fuel) resources. And on Lazar’s large (10-acre) property, these plants can flourish without impinging on neighbors. Also, they generally come up to their natural edge, when they reach the limit of their tolerance to moisture or dry soils. The home landscape is also where Lazar has tried out trees and shrubs he wants to sell at the garden center, to glean firsthand growing insights. 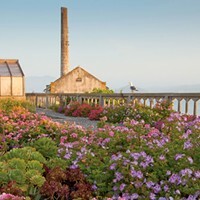 For instance, he’s planted hydrangeas in varying degrees of shade to see just how much they can take and still bloom prolifically. 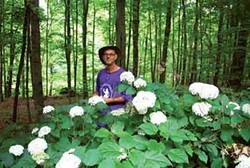 His hedge of Annabelle hydrangea is in moderately deep shade yet still throws big, puffy, creamy white blooms like mad. Annabelle is not unusual by any stretch—it’s widely available—but that doesn’t make it any less a treasure in Lazar’s mind, because it is such a lovely workhorse. Finally Lazar shows us a magnolia, not currently in flower but handsome, with its big dark green leaves. He planted it in 1990, when his younger daughter Cass was born. In terms of sentiment, this is the tree that Lazar will most miss when he relocates to the Phantom site. Lazar wants to continue to sell plants, because he loves introducing people to worthies like the doublefile viburnum, fringetree, and Annabelle hydrangea. But the call of education, especially around sustainability, is getting stronger. A big component of sustainable landscapes is moving toward the edible. Lazar recommends people start with The Complete Book of Edible Landscaping by Rosalind Creasy. He is also a fan of local garden expert Lee Reich, whose books include Uncommon Fruits for Every Garden. He says that Mother Earth News is also a terrific source of organic gardening information. You can always ask Lazar—or his wife Pam Neimeth, or any of the knowledgeable staff—questions at Phantom. Soon, the superfit Dad in his 50s will be taking on a more profound teaching role, and our region’s sustainability movement will be the better for it. Lamium Maculatum grows in the dry shade of Lazar's Sugar Maples. Norbert Lazar with Annabelle hydrangeas at home. The sign outside Lazarâ€™s Garden Center in Rhinebeck.